Like I've mentioned yesterday, I have read both versions and unfortunately for Ms JK "Rolling In Money" Rowling, I actually enjoyed reading the fake version more. Both started off continuing where Harry Potter And The Half Blood Prince (HP6) left off, at the point where they just came off Dumbledore's funeral after Snape killed him. Both versions also started off focusing on the search and destroy of the Horcruxes as well as the realisation of Harry Potter himself being one of the 7 Horcruxes i.e. the Horcrux in him has to be destroyed before Voldemort return to being mortal and thereafter able to be killed. Both books led us to think that in order to to destroy the Horcrux inside, Harry himself has to make the ultimate sacrifice, which turned out otherwise as I will elaborate further later. Given there was mention of Bill and Fleur's nuptials in HP6, the eventual event was also covered in both books. While the rest of the book is devoted to seeking and destroying the Horcurxes, this is where the two versions start to drift apart. Among the 7 Horcruxes, 2 were already destroyed in HP6, namely Tom Riddle's Diary and Marvolo Gaunt's Ring. The remaining 5 were the Salazar Slytherin Locket, Helga Hufflepuff Cup, Rowena Ravenclaw Diadem, Nagini the snake and last but not least, Harry Potter himself makes 7 in both versions but the location of each item and how they were destroyed were vastly different. In the real version, Nagini was the last Horcrux to be destroyed after Voldemort's own soul i.e. the Horcurx itself, in Harry was destroyed when it was struck by Voldemort's own "Avada Kedavra" in the Dark Lord's attempt to kill Potter. In the fake version however, it was Harry Potter who cast the "Avada Kedavra" curse on Voldemort and this killing cause part of Harry Potter's soul to split and thus create his own Horcrux. As it turn out, he own soul was left intact and the bit of soul that got split up was actually in fact, the very same piece of soul that was lodged in Harry Potter when Voldemort tried to kill him when the latter was still an infant. The Horcrux that Harry created was a charmed snitch that Dumbledore left them and it flew into The Veil in Death Room with Voldemort's soul upon the death of the Dark Lord. Another big difference between the two books was Snape. In the real version, Snape turned to the be good at the end as it was revealed that Snape was working undercover. Snape did not really kill Dumbledore as the old wizard was going to die anyway. Snape, in the fake version, however was true and true a bad person only to be defeated at the end and locked up in Azkaban for life when the war ended. In a way, I was happy to read both as both are equally enjoyable of the same story. Two for the price of one. My only disappointment and perhaps what swayed my vote over to the fake version was that I can sense fatique in Rowling's writing. Can't blame her for it has been 7 books altogether and I can feel like she is rushing through this 7th book as if trying to just get it done and over with. The jaded feel of the writing as it Rowling has had enough of it all as the passion for Harry Potter is slowly fading away. Anyway and that's that. I am putting a link for anyone interested in the fake version to download and read for him/herself. The original fake version was 888 pages but I discovered that it was padded up with some irrelevant medical journal at the back. I have since removed that to reduce the filesize from 4.2 mb to 2.4 mb as well as remove the redundant password restriction. Tammy: I have a copy offline. Drop me an email and I will send it to you. Well, isn't it against copyright laws to publish a fake version of a story? I mean - if one wants to be a successful author, then write their own story instead of a fake version of someone else's story. I don't know how did you get that the seventh book is, as you put it, jaded. 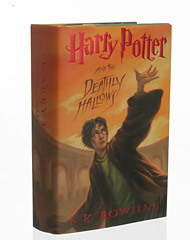 It is as great as ever - maybe you should re-read the part when Harry visited Godric's Hollow or the last chapters. Rowling's description of life's worth is incredible. Tolstoy did its polar opposite in his Anna Karenina's ending, he was very authentical with the thoughts of a suicidal person. Whilst Rowling just wrote that life is a treasure, a miracle. And Rowling's character drawing can be compared to Mikhail Sholokhov's (And Quietly Flows the Don). Mina Jade: Welcome to the blog. As far as copyright concerns of fake version of an original story, that is between the two authors to sort it out. Parallel spoofs has been around for ages. Some people wrote them as they feel that they have a different interpretation or they feel that they can write better. I do not think that these spoof writers have any commercial interest to "hijack" a famous title. Most of them just did it out of interest sake. The way I see it, I don't see how the spoof will affect the sales of the originals as I will still shell out money to buy the original book regardless if I read the spoof. As for my feel that the 7th book is jaded, well that's just my personal opinion and I do not expect everyone to agree with me. If you think otherwise, I accept that as your own opinion.